Pawn is one of chess soldier that stand in front of all main soldier to protect the King. Pawn always move first in the game. This chess piece not popular as King or Queen, but its move also determine the strategy. On the picture is one example of our Pawn chess piece in 12 inch size. It is brown color or natural wood color. It has made of Teak wood and carved by professional craftsman. This carved wooden pawn chess piece is standart chess models. We have various models of chess pieces and you can contact us for the details. Beside that, we provide chess set with its board and chess table. 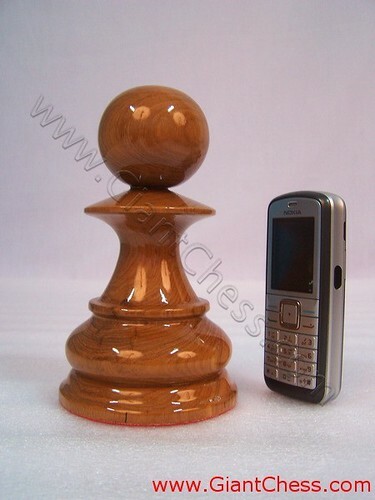 We are manufacturer of chess pieces in some sizes. We have 12 inch, 18 inch, 24 inch, 36 inch, 42 inch, and 72 inch. Order now, and we will give you good prices. Indonesia has known as one of Teak producer country which spread along its islands. There are about 0.6 million ha of production plantations and most are based on seed from these production areas. It is planted extensively in Java by Perum Perhutani (a state forest enterprise and which is responsible for the management of teak). Teak is the most important commercial tree species in Indonesia. Indonesia Teak has known as one of good quality wood. It commonly used as furniture material especially for outdoor and garden furniture. People usually like to buy Teak wood furniture because it durable in any seasons and weathers. Those are big chess pieces which carved by our talented craftsman from Java - Indonesia. As handmade product, those chess pieces are kind of unique and antique products. It is beautiful with natural brown polish and add with glossy touch. Wooden big chess pieces above are handmade one at a time. The chess pieces are made of a highly durable cloth. They can be rolled or folded for very easy storage. Each pieces has been tastefully designed with finest materials available. Teak wood has choosen as its main material, so that you can use it as outdoor chess game. It is very durable and strong. You just need the chess board to play outdoor chess board. While the boards come in many sizes to fit our chess sets.